This Thanksgiving I decided to make a very unusual turkey – Tandoori Turkey. However, 2 of my friends that celebrated with me are vegetarians. I really wanted them to experience the tandoori marinade I made for the turkey, so I decided to make roasted potatoes with the marinade. Wow…these were fantastic. I’m so glad I decided to create this dish. I will definitely make these again. Rinse and quarter potatoes. Toss with olive oil and place in a 13X9″ baking pan. Set aside. Combine yogurt through salt in a blender. 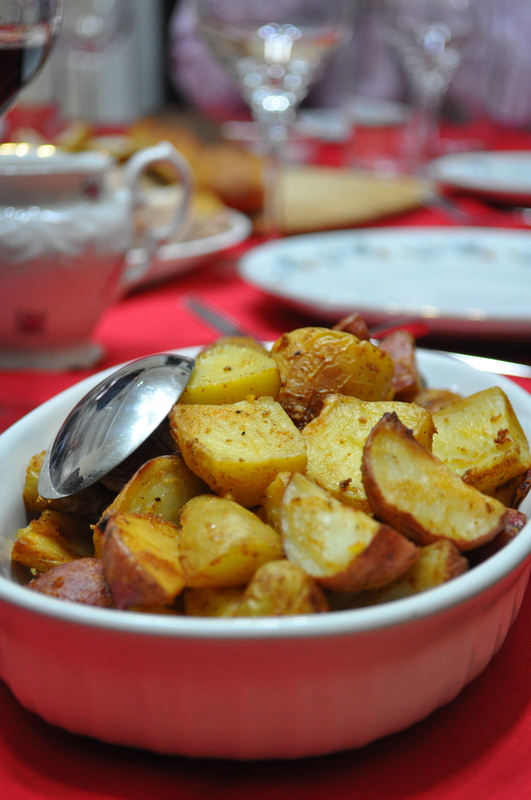 Toss 1/2 cup yogurt marinade with potatoes, or enough of the marinade to evenly coat the potatoes. Bake for 30-40 minutes, stirring after every 10 minutes to prevent sticking. This Tamale Pie is a TASTY variation of a vegetable pot pie. As someone who grew up on Tex-Mex food, I absolutely love this dish and make it quite often with all sorts of different fillings. This particular variation uses butternut squash, winter greens and potatoes. 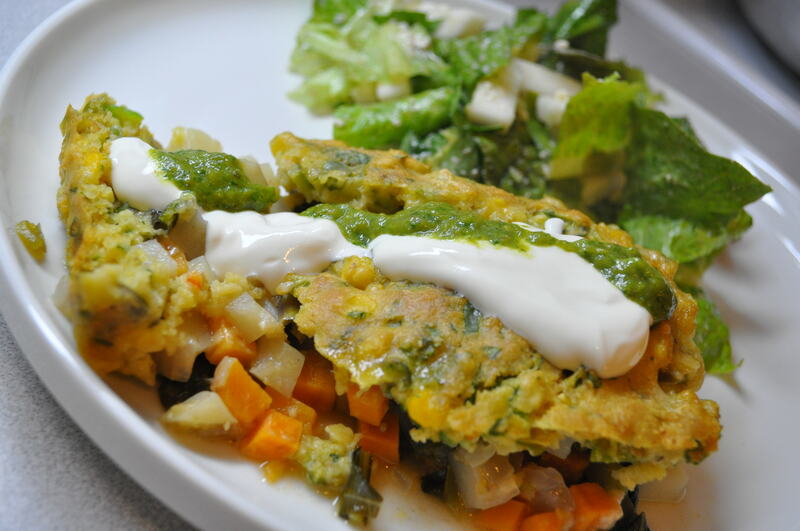 Top with organic sour cream and Tomatillo & Cilantro Salsa and serve with Mexican Cabbage Salad or a simple green salad. Adapted from Moosewood Restaurant Celebrates Cookbook. In a large stockpot, saute onions, garlic salt and chili in the oil until the onions start to brown, about 10 minutes. Stir in the cumin. Add the water, broth, potatoes and butternut squash. Bring to boil. Reduce the heat and simmer for about 15 minutes. Add kale/swiss chard and simmer for an additional 5 minutes, until the vegetables are tender. Stire in the lime or lemon juice, transfer stew to a 9X13-inch baking pan (prepared with cooking spray). Sprinkle on the cheese. In a bowl, stir together cornmeal through cilantro. In a separate bowl, combine the eggs, buttermilk and oil. Fold the wet ingredients into the dry ingredients just until mixed. Pour the topping over the stew and cheese and spread evenly to cover. Bake for 30 minutes, until a knife inserted in the topping comes out clean. Serve hot, topped with sour cream (if you aren’t vegan) and Tomatillo & Cilantro Salsa. A few summers ago, my husband and I spent 10 days traveling throughout Ireland. One of our favorite things to do, after a long day of urban or rural hiking, was to find a pub and have a pint of Guinness, followed by a bowl of hearty, Guinness beef stew and listen to live music. This recipe is based on The Irish Pub Cookbook, that I picked up while in Ireland. To make it healthier, I reduced the butter, oil, and beef, and increased the vegetables. Plus I added some tomato paste and red wine vinegar for some extra flavor. Serve over a bowl of mashed potatoes. Season the meat with salt and pepper and dredge in flour. In a stockpot or large saucepan over medium heat, melt the butter with the oil. Working in batches, cook the meat on all sides for 5-7 minutes, or until evenly browned. Remove from the pot. Stir in onions and cook 3-5 minutes, or until soft. Return all the meat to the pot and add enough of the beef broth and the Guinness to cover. Bring to a boil, reduce the heat to medium-low, cover and simmer for 60-70 minutes, or until the meat is nearly tender. Add the carrots, parsnips, turnip, and tomato paste and cook for 30-40 minutes, or until the vegetables and meat are tender and the stew begins to thicken. Mix 3 tbsp flour with 1/2 cup of stew liquid in a small bowl. Stir into the stew and cook for 5 minutes longer. Add red wine vinegar, season with salt and pepper to taste, stir, and remove from heat. Serve over mashed potatoes in shallow bowls. 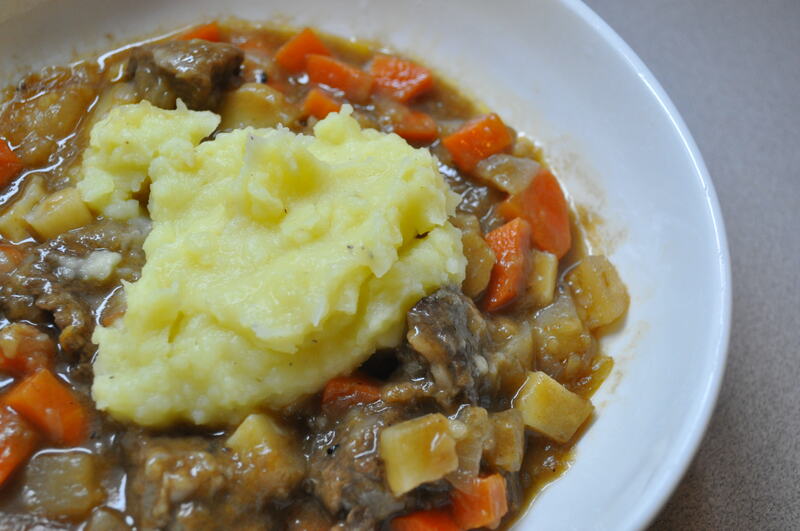 Serve these hearty mashed potatoes with Irish Guinness Beef Stew. Prepare potatoes in a pressure cooker. Mash in a large bowl with half and half through parmesan cheese. Season with kosher salt and freshly ground pepper to taste. 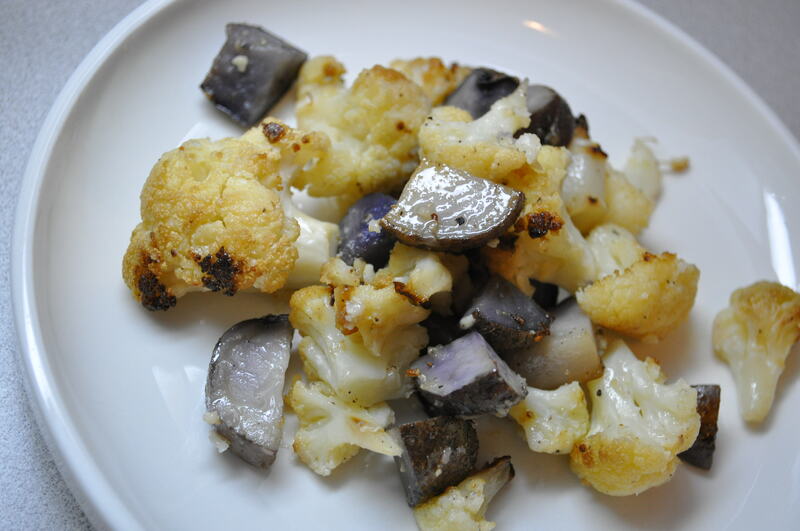 Preheat oven to 425 degrees F. Toss cauliflower, potatoes, oil, garlic, salt and pepper in a large bowl. Spread evenly on a 9X13″ baking dish. Bake for 25-30 minutes, stirring occasionally, until golden brown. Recipe adapted from From Curries to Kebabs: Recipes from the Indian Spice Trail. Cook potatoes in pressure cooker, according to your pressure cooker’s directions (or boil potatoes in a large pot of water until tender, about 7 minutes). Pour oil into a large pan or wok and turn heat to medium-high. When the oil is hot, add asafetida and then cumin seeds and mustard seeds. 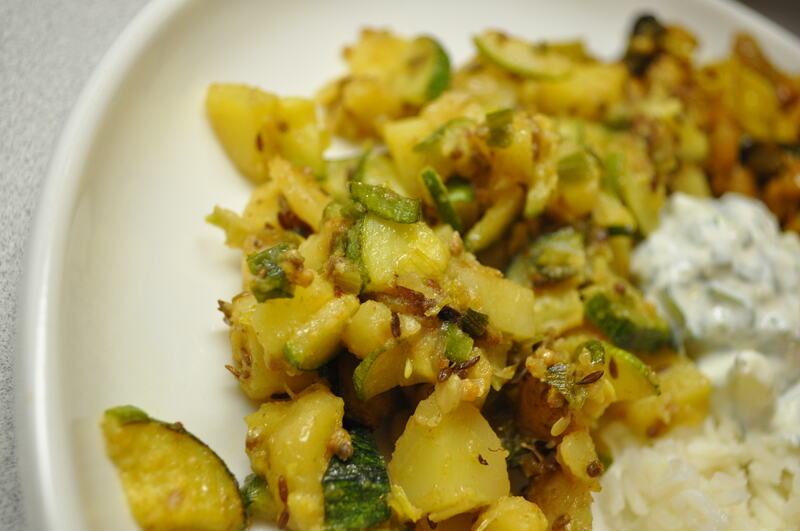 As soon as the mustard seeds begin to pop, add the zucchini and potatoes. Stir fry for 5 minutes. Add the yogurt, and cook, stirring, until the yogurt is absorbed. Reduce heat to low and add coriander and salt. Stir for a minute. Add the lemon juice and toss. Serve with white basmati rice and chickpea curry. 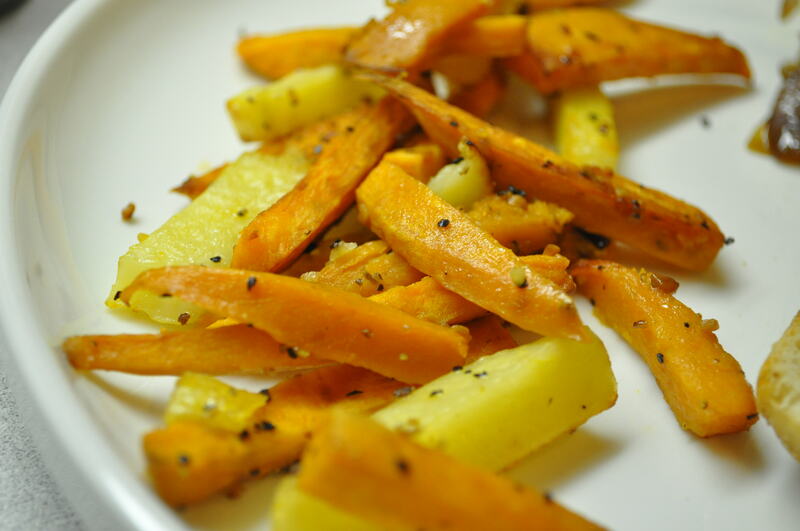 Preheat oven (or toaster oven) to 425 degrees F.
Toss sweet potatoes with oil and seasoning. Place on a 9X13″ baking dish, coated with olive oil. Bake for 20-30 minutes, stirring every 10 minutes until sweet potatoes are tender in the middle and crispy and brown on the edges. To prepare burgers, combine the first 10 ingredients in a large bowl. Add pinto beans and corn; partially mash with a fork. Divide bean mixture into 4 equal portions, shaping each portion into a 3 1/2-inch patty, and refrigerate for 10 minutes. To prepare chipotle mayonnaise, combine mayonnaise and 1 teaspoon chipotle in a small bowl; set aside. Heat canola oil in a large nonstick skillet over medium-high heat. Add patties to pan, and cook 4 minutes on each side or until thoroughly heated. 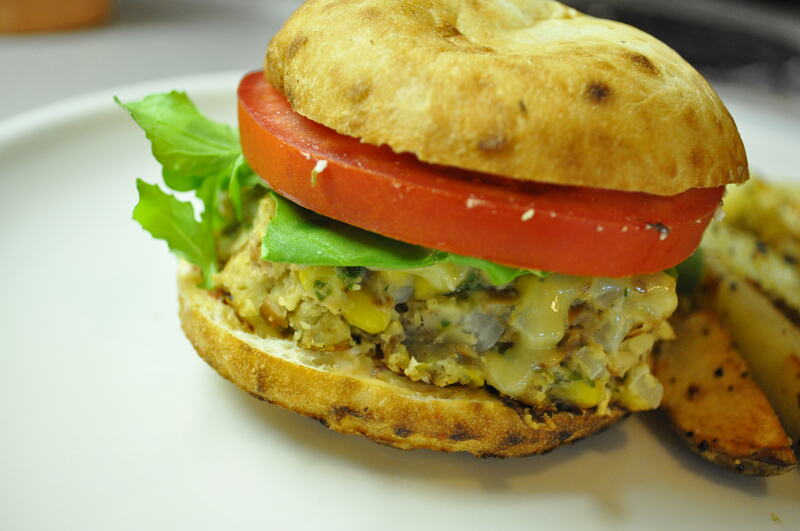 Place patties on bottom halves of buns; top each patty with 1 tablespoon mayonnaise, arugula, one thick slice of tomato, and top half of bun. Saute chopped onion and garlic in 1-2 tbsp extra virgin olive oil over medium-high heat in a large stockpot. Saute until golden (about 10 minutes). Add oregano through salt. Stir and cook for another 3 minutes. Add sweet potato through green chilies. Bring to a boil, reduce to simmer, cover and cook for 15 minutes. Add pinto beans and brown sugar. 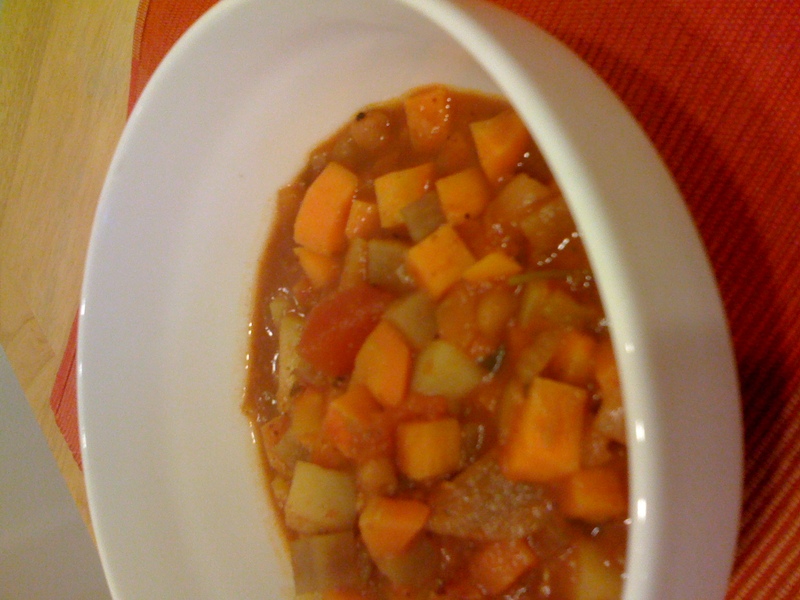 Cook an addition 20-40 minutes or until the carrots, sweet potatoes and potatoes are tender. Stir in cilantro and remove from heat. Serve with shredded cheddar cheese, tortilla chips, sour cream and cornbread. I think I’ll use the apples to make either an apple-cranberry pie with streusel topping or an apple crisp; and the brussel sprouts, kale, and potatoes for a roasted vegetable dish for Thanksgiving dinner. I’ll probably use the broccoli rabe and tat soi in a winter pasta dish for dinner tonight.